I'm coming north in August to run a one day workshop at the Holiday Inn Rotherham-Sheffiled on Sunday 3rd August. The project for the day will be a folio album in one of Graphic 45 new collections just about to arrive here in the UK. For more info and to reserve your place click here and scroll down to the August section. Booking details are top left of the page. I hope you can join Andy the Crafty Elf and myself for another fun day of crafting. If you haven 't entered this months give-away there's still a couple of days left to leave your comment. Heres the link to the post. There's also a couple of days left to leave a comment and go into the drawer to win tickets to the Stamp Magic Show on 8th June. If you'd like to enter, click here and leave a comment before 12 midnight on 31st May. 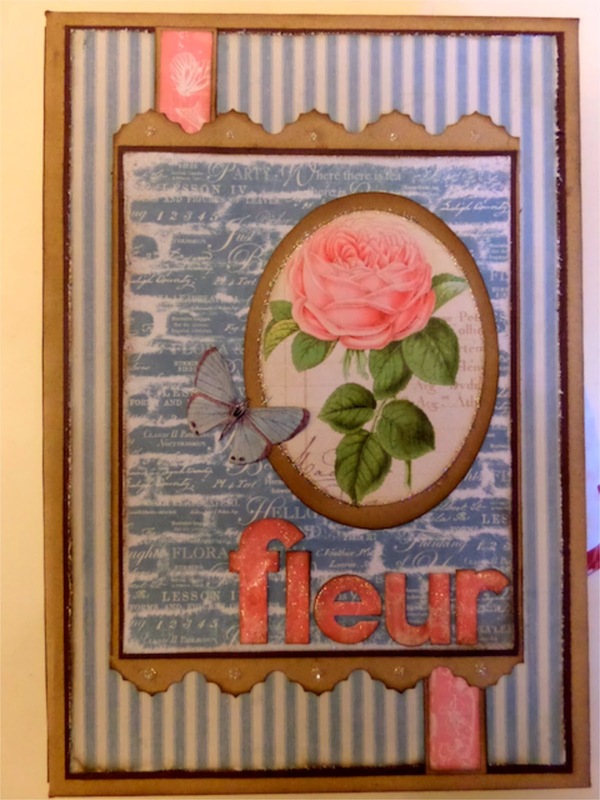 Hi Clare, A beautiful card, gorgeous colours and papers. We have had rain, rain, and more rain here too, let's hope the sun will 'have it's hat on' very soon. Your Fleur album looks gorgeous, fabulous that Oli managed to retrieve your filming, I'll be having a look later, thank you. Dear Clare, what an amazing designer you are!!! I truly am your #1 fan!!! I just returned home from granddaughters college graduation in North Carolina, am exhausted but couldn't wait to see what you had done while I was away!!!!! Oh my gosh I absolutely love this Botanical Tea Fleur Album, love the papers, the colors, the whole design, am on my way to coffee/class this morning at my favorite scrapbook store here in Payson and can't wait to pick up some more papers of Botanical Tea, I have used practically every piece I had from all the sizes of pads!! Going to get my By The Sea this morning!!! Thank you again for sharing your amazing talent and inspiring all of us to get busy!!! Talk to you soon. Margaret take it from me with Clare's guidance you will be amazed at what you can create!!! I am sure you will do well, I have made lots of things running from my computer to the craft room and back again following her videos!!!!! You will have a great time!! Wow, that is absolutely stunning. So inspired I have just booked two places on your "up North" workshop in August for myself and my slightly crazy friend Donna. Can't wait to meet you. Another job well done Clare. I love your designs - just finished Mother Goose - have done French Country which has my friends oohing and aahing with delight. They think I am so talented - but I always give you the credit - my new friend Clare. Thanks so much for sharing. I love listening to your video instructions and following along - so lovely British - I end up saying things like "bits and pieces." Your instructions are great. Will probably have to have this one too!